Dynamic and young, with a promising future, Turkey is the natural bridge between East and West. Founded in 1923 by Atat�rk (father of Turks), the great statesman and soldier, the Turkish Republic is confidently progressing towards being the leader of emerging economies with its 72 million young and industrious brains, numerous universities, vast natural resources, mild and inviting climate and geography for the fast growing tourism industry. Perhaps more than any other city in the modern world, Istanbul embodies the ideal of unification. Somewhere beneath the magnificent waters of the Bosphorus, Europe and Asia meet, making Istanbul the only major city in the world that links two continents and many cultures and religions. There is, of course, far more than geography to the magical hold of Istanbul exerted over man�s imagination throughout its fabulous history. Three separate empires ruled the world from this powerful capital � the Roman, the Byzantines and the Ottomans. Trace of their presence � in ancient walls, imressive hippodromes, royal basilicas, aqueducts, magnificent mosques, brilliant palaces � shape Istanbul�s alluring landscape and color its exotic texture. For more than 3000 years, this city has been at crossroads of cultures, a rendez-vous of the East and West. Today, Istanbul blends the ancient and the modern in a seamless tapestry of life. It stands, in a new world, as a model of free market economics, enlightened social reforms, cultural and religious diversity. In many ways, Istanbul is the capital of the future � a marriage of East and West for the benefit of both! Seating in the middle of the East and West, Istanbul is easily accessible from almost every corner of the world. Europe and the Middle East are only 3 hours away, while the Americas and the Far East are at a distance of less than 12 hours. Bus : HAVAS company operates regular airport to city bus transportation at half hourly intervals from 06:00 till 24:00 hours. Taxi : Taxis are available around the clock and operate by the meter. 50% surcharge is applied between 00:01 and 06:00 hours. Bus : Public bus transportation has a wide web of services across the city. The fare is the equivalent of $ 1.- One has to pre-buy tickets to board a bus. Taxi : Taxis are available around the clock and operate by the meter. 50% surcharge is applied between 00.01 and 06:00 hours. 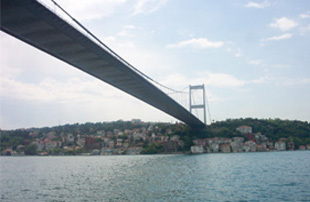 Boat : Ferry boats and fast catamarans operate between the two shores of Istanbul - between Europe and Asia. The boat landings are at Kabata�, Karak�y and Eminon� on the European side and �sk�dar, Kadikoy and Bostanc� on the Asiatic shores. Tramway : Modern tramways operate in the European suburbs of Istanbul, mainly in the old city. Metro : An underground metro system is available between Taksim Square and 4th Levent. A light metro operates between Aksaray and Istanbul airport. Kongresist offers the possibility to organize transfers from and to the airport. Please click here if private transfer is requested. The climate of Istanbul is mild. Good weather and sunshine is the predominant weather during June with temperatures ranging between 17�C / 20�C (64�F / 68�F) during the day and 12�C / 14�C (54�F / 57�F) at night. The Turkish currency is the New Turkish Lira (YTL). Cash may be exchanged in banks and exchange offices during office hours. The official exchange rate is listed daily at the banks and exchange offices. All major credit cards are accepted at most hotels, restaurants and stores. The electric current in Turkey is 220V, 50Hz. any information regarding the exhibition including the contract.